Terrariums ready for Christmas delivery in Rockingham. Beautiful deep red Poinsettias have just arrived in time for Christmas. Available for delivery in Kwinana, Rockingham and surrounding areas on Christmas Eve – but be sure to order early as this traditional Christmas gift always sells out! Our Christmas preparation is well underway! Our Ferrero Rocher Christmas Trees were immensely popular last Christmas so we are hard at work making sure we will have plenty on offer. Perfect for decorating your own home, on the Christmas table or as a gift. If you would like one of our Ferrero Rocher Christmas Trees be sure to order early as they sold out the last two years. Along with flowers and gourmet hampers we will be delivering all Christmas week – right up to Christmas Eve – so you can have your Ferrero Rocher Christmas Tree delivered anywhere in the Rockingham Kwinana area. We have been very busy this year in the lead up to Christmas. With Interflora releasing a new selection guide we have had many images of beautiful flowers to go through to try to select which arrangements we would like to add to our online offering. You can see a few of them here along with our own designs. Also just in time for Christmas we have added the new range of Interflora Gift Hampers to our online selection. But of course, flowers are the perfect choice for someone that has everything this Christmas. 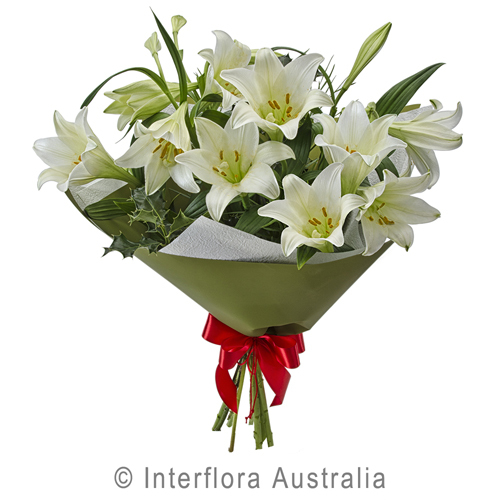 For delivery in the Rockingham area (Mandurah to Fremantle) all arrangements, bouquets, gift baskets and other gift items can be ordered online, however if you see something on our website that you would like be delivered outside this area you will need to call us (08) 9527 5562 to place your order as not all items are available to send through Interflora and the Interflora service fee will need to be added to the price in addition to the standard delivery fee. Those that have signed up to receive our email would have been sent a coupon code (“Christmas 2012”) to use on our website to get a %15 discount on all locally delivered items ordered on our website before 20th December 2012. To be sure that you don’t miss out on future discount opportunities you can sign up here. Finally we would like to wish everyone a very merry Christmas and a safe and happy new year. These two arrangements are an exclusive offer from Hanging Basket Florist. The Christmas Tree (above) stands about 55cm tall and is decorated with Baubles, Ferrero Rocher and Santa Chocolates. Below is our Santas Elves – a perfect Christmas gift that can be used as a Christmas Table Centre – and then dessert! This Chocolate Bouquet is made from Cadbury Magical Elves and is arranged in a Ceramic Vase. Either can be used to decorate your home for Christmas or as a gift the whole family can enjoy. To order the Christmas Tree or Santas Elves by phone call (08) 9527 5562, to order online visit www.hangingbasketflorist.com, or come to our shop at Rockingham Shopping Centre (see link to map below). Delivery is available in the Rockingham area (Mandurah to Fremantle). These items are custom made by our talented florists and must be ordered early due to the time they take to create. See these and other great Christmas gift ideas here. Hanging Basket Florist have many great ideas for Christmas this year. Flowers and Gift Baskets make perfect presents for those that have everything. We can create a beautiful arrangement or bouquet of flowers (like the one pictured) and deliver it anywhere in the Rockingham area during Christmas week, right up to Christmas Eve. Even if you need a present for someone who doesn’t particularly like flowers we can send a gift basket like the one shown above, a basket of plants, or a chocolate arrangement.